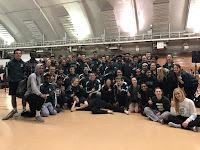 Thursday night gave a glimpse into the future of Madison Memorial track & field as our freshman and sophomore athletes traveled to Waunakee to represent JMM against some of the best young talent in the area. The night was overcast and rainy at times but the performances of a few young athletes shown through on the night. The team was led by five 1st place finishes and the depth or our boys team helped us accumulate points. The girls scored 58 points to finish in 5th place while the boys accumulated 180 points to claim 1st place in the team competition. The future looks bright for this group and they will join some of their frosh/soph teammates who were held out Thursday night to compete in Friday's varsity meet. As a coaching staff we look for these athletes to continue to improve each day, month, year and big things will happen for this group as juniors & seniors. On the girls side the individual champions were: Julana DW in the 100m dash (14.1) and Caroline B in the 400m dash (1:05.9). Also scoring points for the girls team were: 2nd place finish by Holly H in shot put (31' 8"), 3rd place finishes by Carlie L in the 100m hurdles (19.9), Sarah H in the pole vault (6' 6"), & Holly H in the discus (83' 3.5"), 4th place finishes by Kelly S in the discus (76' 2.5"), & Lilly S in the 1600m run (6:01.0), 5th place finish by the 4x100m relay team, 6th place finishes by Julana DW in long jump (12' 3.5") & Carly H in the 1600m run (6:02.0), and 8th place finishes by Nicole O in discus (53' 8.5"), Kelly S in shot put (26' 0"), & Izzy O in the 1600m run (6:04.0). On the boys side championships were earned by: 4x100m relay team (49.30), John A in the shot put (35' 8.5"), and Van T in the long jump (16' 8.25"). Other earning points for the team victory include: 2nd places by 4x800m relay (9:26.9), Calvin J in the 800m run (2:14.7), & Ahmed K in the 100m dash (12.5), 3rd place finishes by Ryan Y in the 200m dash (25.8), Casey GT in the 3200m run (10:54.0), the 4x400m relay team (4:10.3), Donovan O & Ryan Y in the high jump (5' 0"), Van T in the triple jump (35' 7"), & Dondreon C in the pole vault (9' 0"), 4th places by Gino S in the pole vault (8' 6"), Jonas B in the 800m run (2:19.4), Donovan O in the 400m dash (59.5), & the 4x200m relay team, Ben H in the 100m dash (12.6), 5th places earned by Matt J in the 1600m run (5:24.0), Cortez T in the 300m hurdles (50.8), Austin W in the 800m run (2:24.1), Kyle F in the 200m dash (26.4), Trevor W in the 3200m run (11:26.0), James N in shot put (34' 1"), & John A in discus (82' 6.5"), 6th place finishes in the pole vault by Tommy K (8' 0"), in the 800m run by Ty B (2:26.0), in the 1600m run by Chris M (5:25.0), in the 100m dash by Van T (12.6), & in the 110m hurdles by Cortez T (21.5), 7th places finishes by Ben T in the 800m run (2:27.2), and 8th place finishes by Malachi A in the 200m dash (27.1).